Grateful Dead Terrapin Pilot Wings by Rockwings. 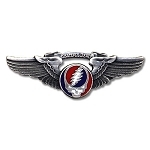 Officially licensed by the Grateful Dead® and made by a deadhead pilot, these wings will keep you flying high. Wingspan measures approximately 2" .